I’ve mentioned that apricots are one of my favorite fruits, and I underscored that with two additional apricot appearances. In every instance, I combined the apricots with some kind of pork. It’s occurred to me that this trait—call it porcine compatibility—maybe the best measure of my appreciation for a given fruit. This week, to put perhaps too fine a point on it, I’ve chosen another of my all time favorite fruits, Mission Figs, and, lo and behold, combined them with bacon. 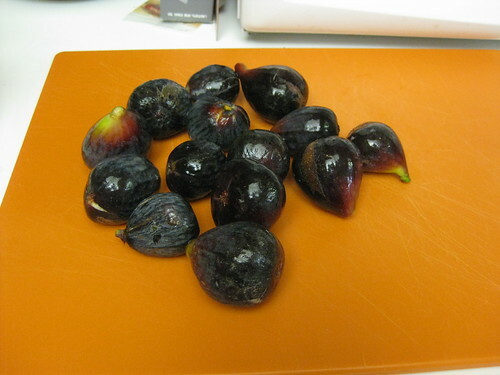 The Farmers’ Market is rife with figs right now, a wonderful occurrence but one that can make for tough decision making. 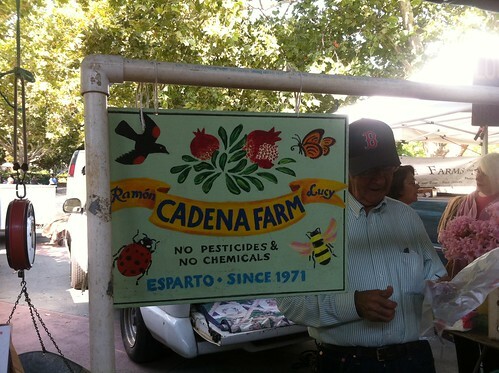 I opted for a basket of super ripe figs from Cadena Farm in Esparto, CA. While at the market, I also picked up three pounds of Bledsoe’s double smoked bacon and a package of lavash bread from East and West Gourmet Afghan Food—also known here as “the Bolani guys”—a great purveyor of Middle Eastern breads and sauces. 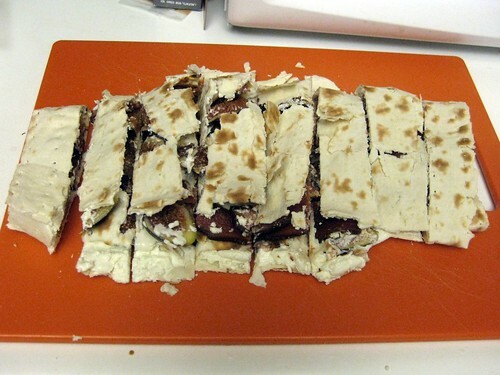 This acquisition gave me the idea to make a lavash sandwich with bacon, figs and goat cheese. I invited a friend over and we got to work. 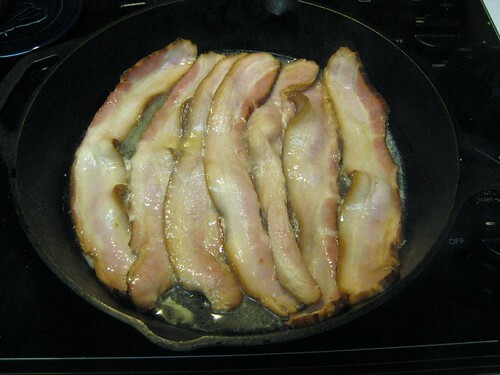 I began by cooking seven strips of the bacon in a skillet. 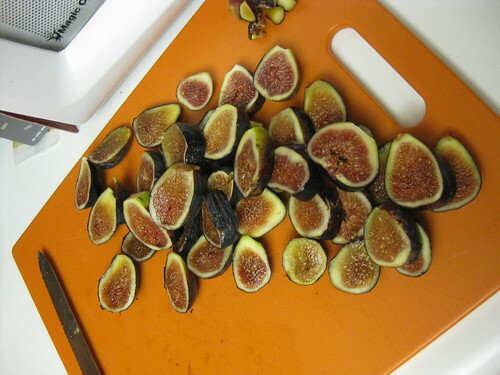 While the bacon cooked, we sliced the entire basket of figs into thick slices. 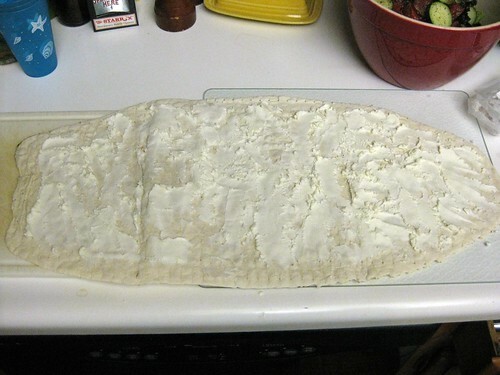 Then we laid out the lavash and spread it with Laura Chenel ChÃ¨vre. 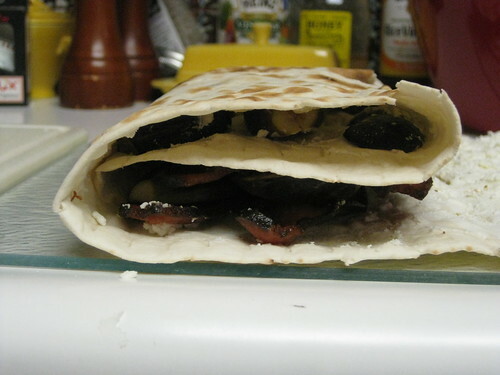 I laid out some figs on one end of the lavash, then folded that piece over and arranged the bacon in two clusters with enough space between them to fold one section over onto the next. 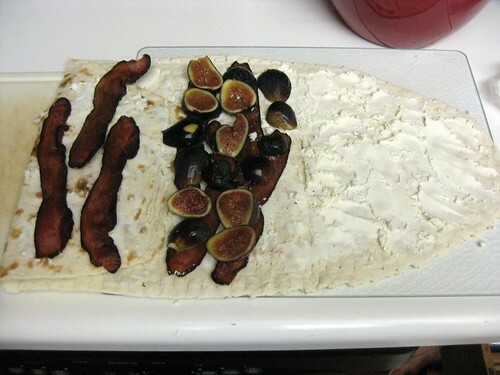 We laid more figs on top of half the bacon, then folded the lavash over until it was a roll similarly in size to a large burrito. We warmed it for a few minutes in the oven, then sliced and served it. Figs and bacon are one of the most natural combinations I can think of. The mild sweetness of the figs are a perfect compliment to the smokiness of the bacon. Adding the creamy chÃ¨vre to the equation smooths everything out and without overpowering. I think you could really enjoy this combination anyway you wanted, rolled in lavash is just one finger friendly solution. One note for the future: I would warm the lavash before working with it so that it’s softer and less prone to breaking.